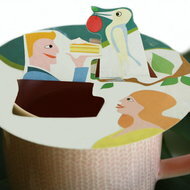 Celebrate your friendships with these colorful tea accessories. A unique gift to receive, give and share! Peacock illustration: Let a friend know that you are proud of her and she means a lot to you. The peacock shows his feathers. 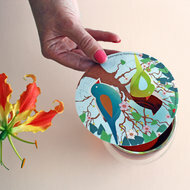 Love Birds: This colorful bird couple meet each other in the tree, where they are surrounded by beautiful blossom. Hugs: little one gives a hug. Twin Design Mix is a set with 6 designs. Order the twin waverz per 6 packages and surprise more friends with steam waverz. Elevate your mood with these steam waverz above a nice cup of tea or coffee.